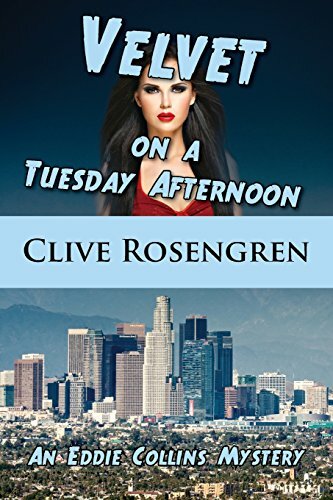 “Velvet on a Tuesday Afternoon” by Clive Rosengren is the third book in the Eddie Collins Mystery series. PI Eddie Collins is surprised when a beautiful old flame shows up at his office. Carla Rizzoli is both an exotic dancer and an actress. Her stage name is Velvet La Rose. Carla’s estranged brother Frankie sent her a note to let her know that he was in danger and that she needs to watch her back. Then he simply disappeared. She seeks Eddie’s sleuthing expertise to find Frankie. Sparks immediately start flying as Eddie and Carla reconnect, and she quickly becomes more than just a client. Eddie also soon discovers that his search for her brother is not going to be an easy one. His search takes him down to Skid Row, where he has to deal with some tough individuals who have nothing to lose. He also discovers a link between Frankie’s military past and Carla’s current employers. The search soon becomes desperate when Carla disappears. Trying to find answers while keeping himself alive and out of danger is tough. Adding his renewed passion for Carla into the mix really brings the drama to life. Even though I hadn’t read the first two books in the series, I had no difficulty stepping into this story. If anything, my enjoyment of this novel piqued my interest in going back and reading the first two. The characters are well developed and believable. The protagonist Eddie is likeable, and someone whom I would enjoy following in a series. The romantic detective style adds a classic noir touch, but the Skid Row setting really brings it into the present. This dichotomy adds a very interesting touch of creativity from the author. Fans of detective mysteries will really enjoy reading “Velvet on a Tuesday Afternoon.” Every time I had to put it down, I looked forward to catching a moment where I could take a break and pick it up again. The author Clive Rosengren knows how to write a great mystery. I fully intend to read the other books in the Eddie Collins Mystery series. I think it would also make a great selection for a reader’s group.